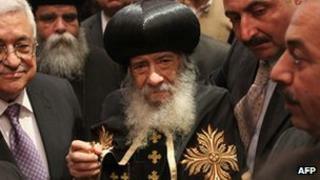 Egypt's Coptic Christian Pope Shenouda III has died at the age of 88, state television has announced. The leader of the Middle East's largest Christian minority was reported to suffer from cancer that had spread to several organs. Coptic Christians make up 10% of Egypt's population of 80 million. After attacks on Coptic Christians in recent years, Pope Shenouda urged officials to do more to address the community's concerns. Pope Shenouda led the church, one of the oldest Christian communities in the world, for four decades. His political adviser Hany Aziz told Reuters news agency that Shenouda "died from complications in health and from old age". He had returned recently to Egypt after seeking treatment abroad. Pope Shenouda was born Nazeer Gayed into a devout Christian family on 3 August 1923 in Asyut, Upper Egypt, and became a monk in 1954, taking the name Shenouda. After Pope Cyril died in 1971, Shenouda was enthroned as Pope of Alexandria. He fell out with President Anwar Sadat, who in 1981 sent him into internal exile. He was allowed back to Cairo by President Hosni Mubarak four years later. The BBC's Jon Leyne in Cairo says Pope Shenouda sought to protect his Christian community amid a Muslim population by striking a conservative tone and lending tacit support to President Mubarak's rule. Whoever succeeds him now faces the task of reassuring the Coptic community as the Islamists of the Muslim Brotherhood look on the verge of sharing power in Egypt for the first time, our correspondent says. Many younger Copts will now be looking for a leader who can help redefine their community's role in a rapidly changing post-Mubarak Egypt, our correspondent adds.